3.Will it build good will and better friendships? Your project should be a public talk integrated with a multimedia presentation intended to communicate ideas, information, or themes. The judging will include speech, multimedia presentation, and the integration between the two elements. Suggested platforms for the multimedia include: PowerPoint, Prezi, Video, or similar. The TED Talk must be between 5-7 minutes in length. Shorter or longer presentations will not be considered. You can work individually or as a small team of 2-3 students. Previous prize winners are not eligible to compete again. Also see website for details, tutorials and previous YouTube Videos. 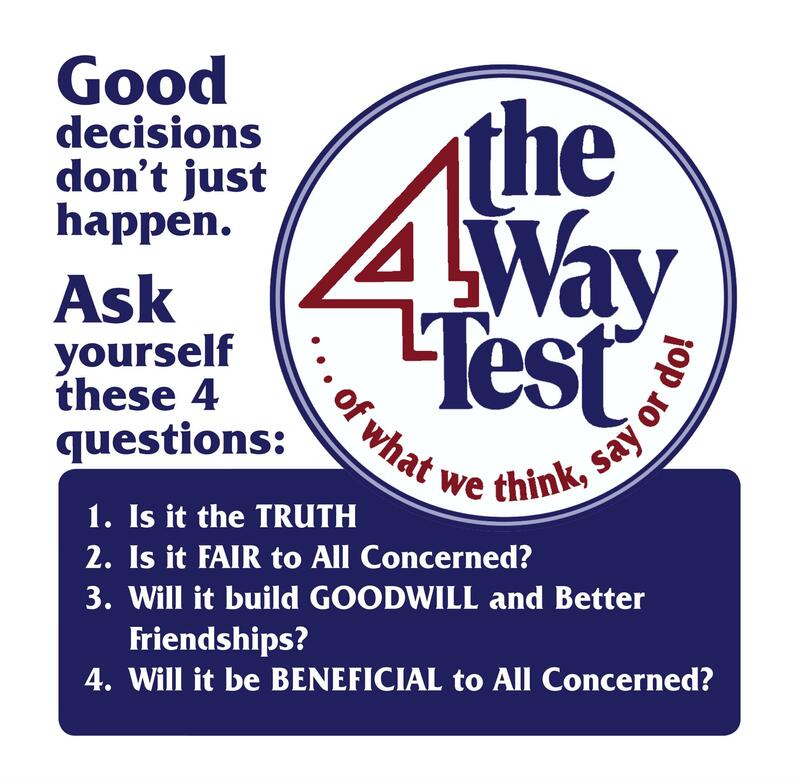 Integrate Speech and Multimedia in a TED Talk to present or explain all 4 of the elements of the Rotary 4-Way Test (1. Is it the truth? 2. Is it fair to all concerned? 3. Will it build good will and better friendships? 4. Will it be beneficial to all concerned?). Projects should be a public talk integrated with a multimedia presentation intended to communicate ideas, information, or themes. The TED Talk must be between 5-7 minutes in length. Shorter or longer presentations will not be considered Students can work individually or as a small team of 2-3 students. Should reach the Chair by March 15, 2016. Winning entries will be announced by March 31, 2016 and the FIRST PRIZE WINNER’S presentation will be shown at the Rotary District 5360 Annual Conference, held in Canmore, AB from May 13 - 15, 2016. Copyright laws must be followed. Any resources used to research or enhance the presentation must be properly cited on the registration form. 2015 First Prize winners’ video: Cecilia Reid and Roya Akbary students from Lethbridge WCHS teamed up to win the first prize with a video that show the 4 way test applied to ethical shopping. The second place was awarded to Tiffany Trinh with a video about the 4 way test applied to the use of cellphones. 2014 First Prize winners’ video: The “Four-Way Test Multimedia Contest 2013-2014” of Rotary District 5360, had participants from just one school in southern Alberta. Tiffany Dang and Leah Kling, grade 11 students and members of a local Interact Club, teamed up and won the first prize over several others. This video was shown, and first, second, and third prize cheques and certificates were presented by District 5360 Governor, Pat Killoran, Rotary International President’s Representative, Jerry Summerhays, and District 5360 Four-Way Test Committee Chair, Hans-Henning Mündel, to all four students, who were present at the April 13, 2014 event at the District Conference in Lethbridge. 2013 First Prize Winner’s video: Amenhemet (Bacho) Sanchez, a 16-year old grade 10 student and member of a local, Lethbridge, Alberta, Interact Club, prepared this inspiring presentation to garner the first prize.